They came by the tens of thousands from organizations and businesses across the Island to fill downtown streets last Thursday and deliver a big, noisy kickoff to Montreal’s annual Centraide campaign. And McGill’s contingent, led by Principal Suzanne Fortier as well as the 2014 McGill Centraide Campaign Co-Chairs Vice-Principal (Research and International Relations) Rosie Goldstein, Dean of Law Daniel Jutras, and SSMU President Courtney Ayukawa, joined in the fun on McGill College Ave. and Ste. Catherine St. They came by the tens of thousands from organizations and businesses across the Island to fill downtown streets last Thursday and deliver a big, noisy kickoff to Montreal’s annual Centraide campaign. 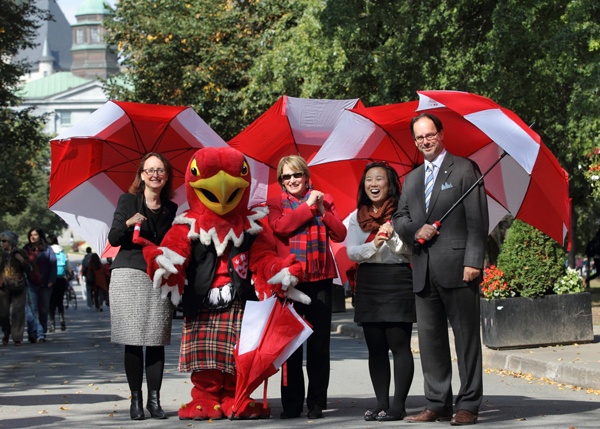 And McGill’s contingent, led by Principal Suzanne Fortier as well as the 2014 McGill Centraide Campaign Co-Chairs Vice-Principal (Research and International Relations) Rosie Goldstein, Dean of Law Daniel Jutras, and SSMU President Courtney Ayukawa, joined in the fun on McGill College Ave. and Ste. Catherine St.
Marty the Martlet was his usual dashing self, posing for pictures with both McGill and non-McGill participants. The McGill group whooped and hollered with gusto as they were announced when turning the corner onto Ste. Catherine. The McGill Campaign’s goal this year is to raise $425,000, an increase of $25,000 over the $400,000 target raised last year. And so far, it’s off to a healthy start, with about $60,000 raised already. One of the campaign’s important goals this year is to try to not only hit or exceed the target, but to begin to increase McGill’s participation rate up to about 10 per cent from its current level of less than 5 per cent. Although McGill raises more money than any other postsecondary institution in Montreal, its participation rate is comparatively low when compared with peer institutions. Small donations, of few dollars per pay period, add up quickly if there is broad participation within the McGill community. V-P Goldstein stressed that McGill and Centraide share many missions.